The stunning downfall of auto industry titan Carlos Ghosn, whose arrest for financial misconduct was confirmed by Japanese police yesterday, continued to reverberate from Tokyo to Paris as more details emerged of the extent of his alleged wrongdoing. But Japanese Economy Minister Hiroshige Seko and his French counterpart Bruno Le Maire reaffirmed their strong support for the Renault-Nissan alliance masterminded by Mr Ghosn. They did so in a phone conversation last night. Mitsubishi Motors is the third member of this alliance, which the two ministers called "one of the greatest symbols of Franco-Japanese industrial cooperation". They expressed "their shared wish to maintain this winning cooperation". The Nissan chairman is accused of understating his income by 5 billion yen (S$61 million) over five years, while an internal probe has found that he also misappropriated investment funds for personal use. Public broadcaster NHK said yesterday that Nissan forked out billions of yen "without any legitimate business reason" for luxury homes in Rio de Janeiro, Beirut, Paris and Amsterdam, via a Dutch subsidiary that was set up in 2010, ostensibly to invest in start-ups. This subsidiary also allegedly funded Mr Ghosn's family trips and dining. These transactions were overseen by Nissan representative director Greg Kelly, 62, who is also in custody. Nissan is set to oust both men at a board meeting tomorrow. It remains unclear when they will be charged. Reuters cited sources as saying last night that Nissan has uncovered evidence of potential wrongdoing in its finances with its alliance with Renault, where Mr Ghosn is chairman and chief executive. Explainer: What misconduct is Nissan's Carlos Ghosn accused of, and how did it come to light? Mr Le Maire said yesterday that Mr Ghosn was "no longer in a position where he is capable of leading Renault", and demanded that an interim management be put in place immediately. France owns 15 per cent of Renault, which in turn has a 43.4 per cent stake in Nissan. Mr Ghosn's hand-picked successor as chief executive at Nissan, Mr Hiroto Saikawa, could barely contain his outrage at a hastily convened news conference on Monday night, slamming the fiasco as "the dark side of the Ghosn legacy that lasted for a long time". "Excessive authority was concentrated on just one person," he said. "Beyond being sorry, I feel great disappointment, frustration, despair, indignation and resentment." The scandal came to light due to a tip-off from a whistle-blower who received leniency under a new system that was enacted in June to weed out white-collar crime. Observers said the scandal raises questions about Nissan's corporate governance structure. Nissan lost 5.5 per cent in the share market yesterday, while Mitsubishi tanked 6.9 per cent. Renault shares dipped 2.8 per cent in early-session trading, after plunging 8.4 per cent on Monday. 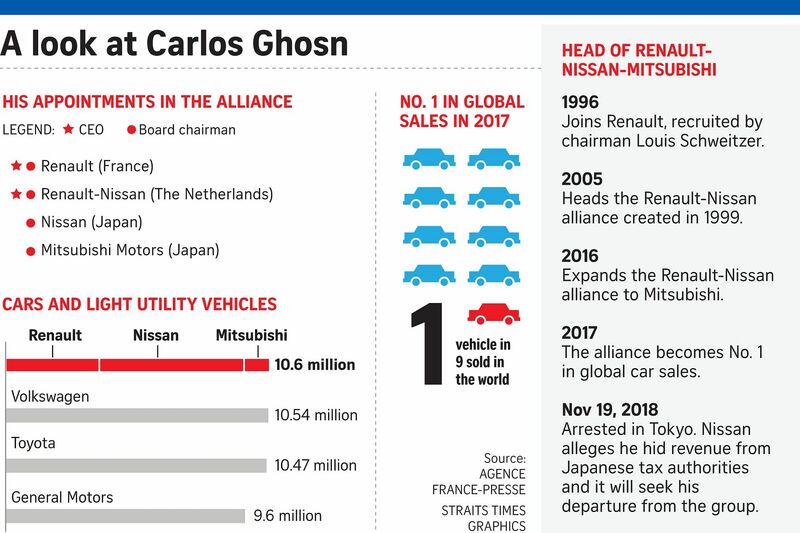 Mr Ghosn's rock-star status has largely been due to his pulling Nissan back from the brink of collapse after joining the company first as chief operating officer in 1999 and instituting drastic reforms. But the combination of his outsize ego, flashy personality and oversized pay package became a tinderbox for criticism both in and out of Nissan. A former employee who quit after a year of working under Mr Ghosn told The Straits Times: "The situation must have got so out of hand that whoever blew the whistle was forced to do so by circumstance." He cited his displeasure over "streamlining decisions that looked only at the bottom line and exposed a complete ignorance of the car industry or the Nissan brand". Mr Nicholas Benes, a representative director of The Board Director Training Institute of Japan, told The Straits Times: "When someone this powerful and almost venerated spans these many organisations, there is lots of room for non-optimal governance and technical violations." Dr Martin Schulz, a corporate governance expert at Fujitsu Research Institute, said: "Huge discrepancies in pay packages of outsize leaders and their often locally contentious strategies are seen much more critically today."